Young's pub in Kingston. It was in the 2007 Good Beer Guide but not the 2008 one. There's a large patio-style beer garden out the back, stretching back quite a long way; the part nearest the pub is sheltered. Inside is quite cosy; there's a pool table and a selection of books on the mantlepiece. Kake, bob, and Richard visited on a Monday afternoon in August 2009. When we arrived a little before 5pm, there were a few people in the front bar, and more in the garden. The garden continued to fill up during our visit, though there were always tables available. 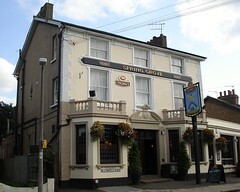 Real ales on handpump were Kew Gold, Young's Special and Ordinary, and Bombardier. We paid £8.84 for two pints of Kew Gold and one of Special. According to the Young's website as of August 2009, food is served noon-3pm and 6-9pm Mon-Fri, and noon-9pm Sat-Sun. Accessibility: Two steps up to get in. Two steps down to the ladies'. Steep ramp down with a sharp bend in it to get to the beer garden. Opening hours and food times taken from the Young's website, August 2009. Last edited 2013-05-10 08:05:30 (version 8; diff). List all versions. Page last edited 2013-05-10 08:05:30 (version 8).